For me, summertime is all about getting outdoors and enjoying the weather. It also means outdoor cooking. If there is ever a choice between the oven or the grill, you know what the answer is going to be. Food just tastes better with a bit of smoke on it. It’s also a way more social experience. Part of the fun of grilling is hanging out with friends and family and getting to enjoy a few beers while you cook. 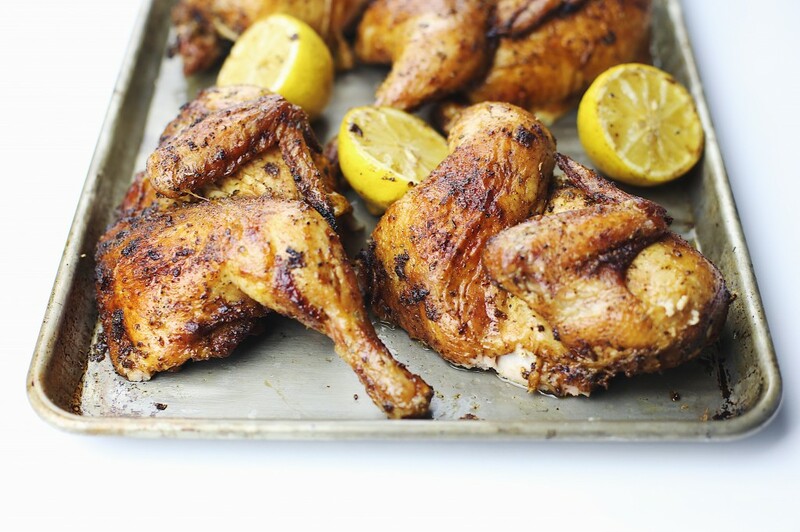 I recently posted a recipe for smoked chicken, and to be honest, this is pretty similar. I wanted to share it though because whenever I make beer can chicken, people seem to be obsessed with it. I don’t know if the beer contributes much flavour to the chicken, but I do know that it’s a fail safe way to make perfect chicken. The theory is that as the beer evaporates, it keeps the chicken moist. It definitely makes sense. It’s the same principle behind keeping a water pan in your smoker, a practice that many pitmasters swear by. Either way, I find that cooking a whole chicken on the bone with skin always results in a juicy finished product. Just stick a thermometer in the thigh and when it’s at 165°F, take it off and let it rest a few minutes before slicing it up. 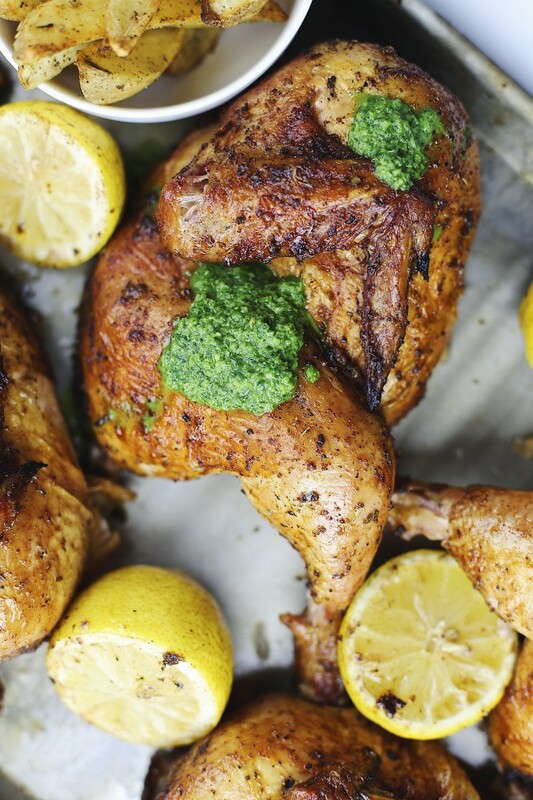 Beer can chicken is all about the fun of cooking it. 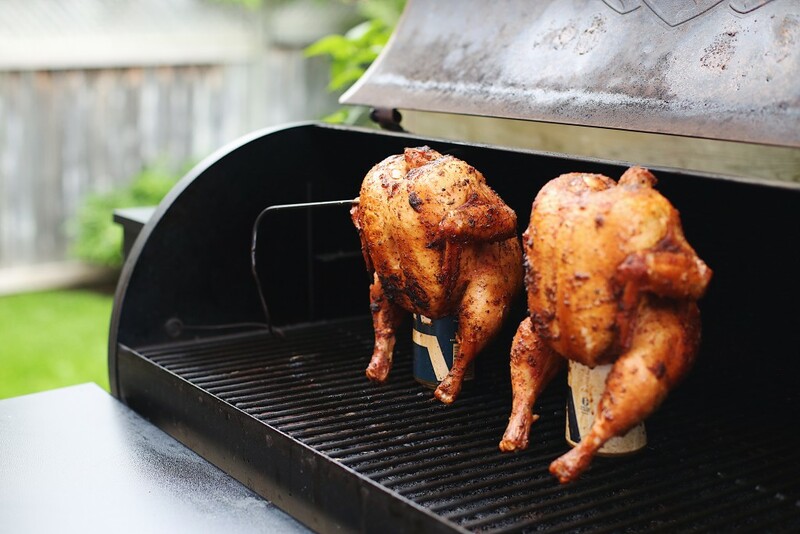 You could just as easily put a whole chicken on the grill and get pretty comparable results, but there’s just something about cooking chicken on a can of beer. You really haven’t lived until you’ve done it. Since January, I’ve been using my Traeger and loving it. Everything I make on it turns out incredible. If you’re in the market for a new grill, I’d highly recommend looking into one. They’ve got a promotion going on right now for fathers day for $100 off a pro series and $50 off Bronson and Tailgater 20 models so check them out at your local dealer. You can make this on any grill, but the smokiness from the Traeger is a nice touch. Another thing I’ve been doing on the Traeger is throwing some halved lemons on while my other food is cooking. The citrus takes on a whole new flavor after it’s been smoked. It’s great on chicken, fish, and even potatoes. I’ve used many different beers with beer can chicken before and to be honest, I don’t notice much of a difference. To be fair, I usually do bold spice rubs on them, which may overtake any beer flavour. If I wanted to really test it out, I’d just use a bit of salt and pepper. For these, I used a few different varieties of Ace Hill, a local Toronto beer. Feel free to use whichever beer you have on hand or like to drink. The spice rub for this will give you plenty of extra. I like to make big batches to keep for later. You could definitely use a different rub than I did. With beer can chicken, just stick to the basics and you can wing everything else as you go. For this recipe, I used the spice rub in the link below but without the coffee. As you can tell, I also made 2 chickens, not 1. Start by drizzling a bit of olive oil on the chicken and then coating it in your spice rub. You want to be generous with the rub and make sure you evenly cover the whole chicken. 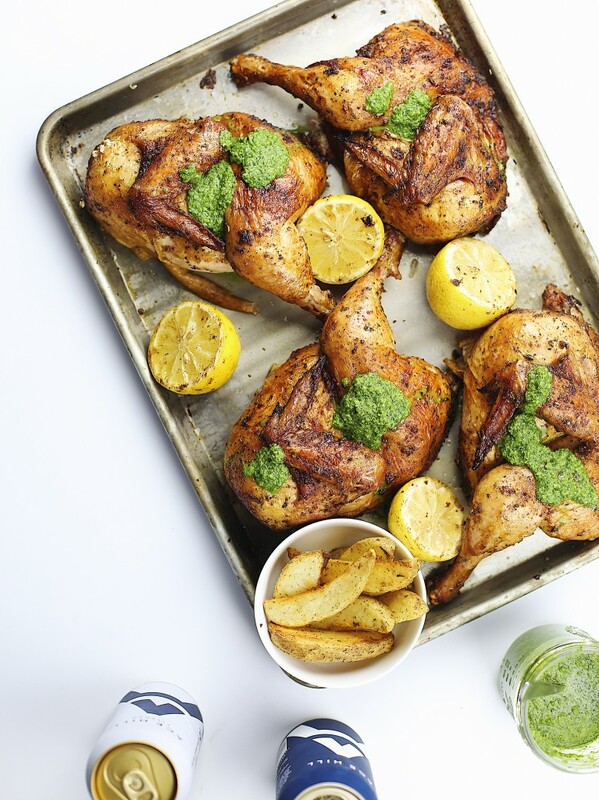 If you have time, you can allow the chicken to marinate in the fridge for a few hours and up to overnight, but if not, try to give the chicken at least 30 minutes with the rub while you preheat your grill. Preheat your grill to 375°F. Crack open a can of beer, and drink about 1/4 of it. You don’t want the can to be full or it will overflow as it heats. Carefully place the chicken on top of the can taking care to make sure it balances. 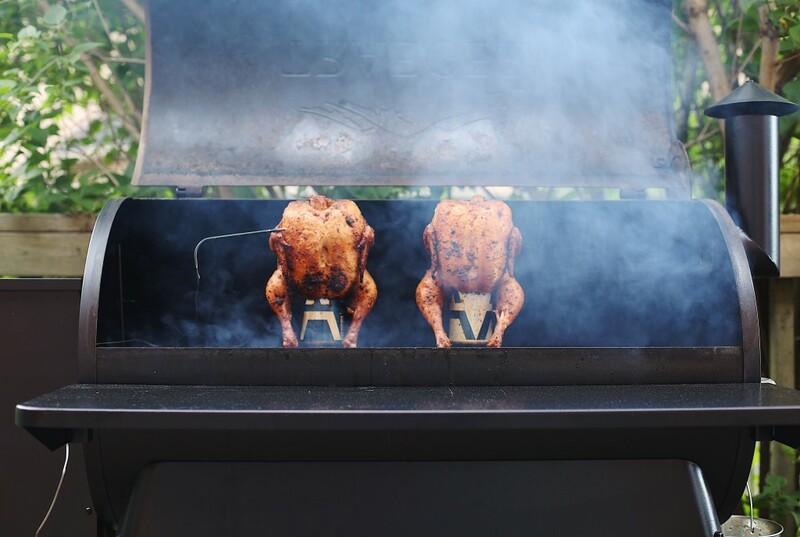 Transfer the chicken (with the can) to the grill and place the can right onto the grates. Close the grill and cook until the chicken reaches 165°F in the thickest part. The exact time will depend on the size of your chicken and grill, but for me, it usually takes 1.5-2 hours. Throw the lemon halves on at the end until they get a nice char to them, about 20 minutes. When the chicken is done, remove it from the grill and allow it to rest for 10 minutes. Very carefully remove the chicken from the can and then cut the chicken into halves, or quarters to serve. I like to serve my Jalapeño salsa Verde with this. This entry was tagged Chicken. Bookmark the permalink.